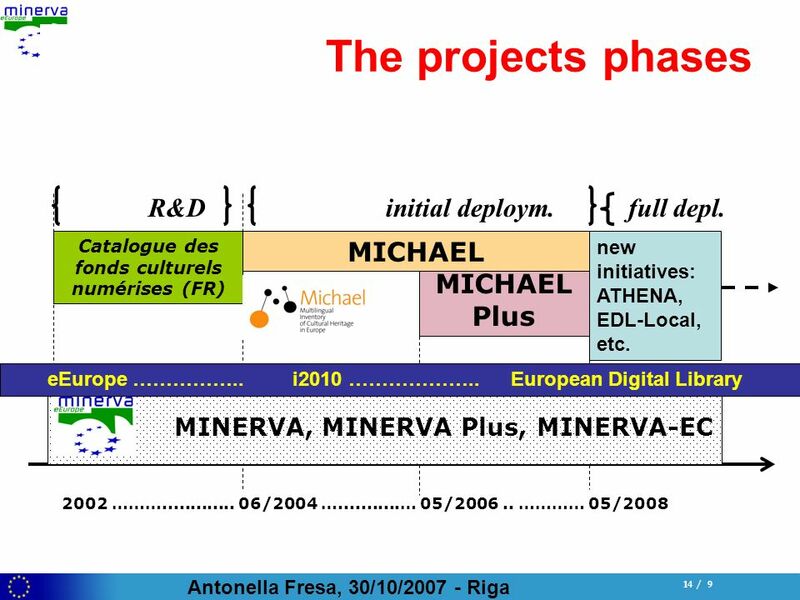 3 Antonella Fresa, 30/10/2007 - Riga 3 / 9 MinervaEC and the European digital library MinervaEC continues the work undertaken by MINERVA and MINERVA Plus towards the elaboration of a platform of recommendations, guidelines and tools for digitisation. MinervaEC supports MICHAEL and MICHAEL Plus initiatives. 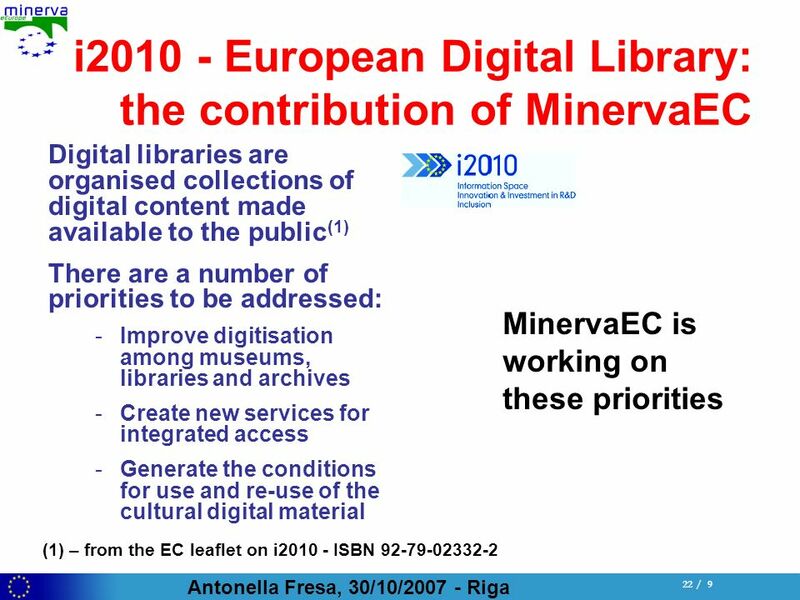 MinervaEC is aligned with: i2010 strategy for a European Information Society for growth and employment, the EC Recommendation on digitisation and online accessibility of cultural material and digital preservation, and the Council Conclusions. In this light, it contributes to the creation of the European digital library. 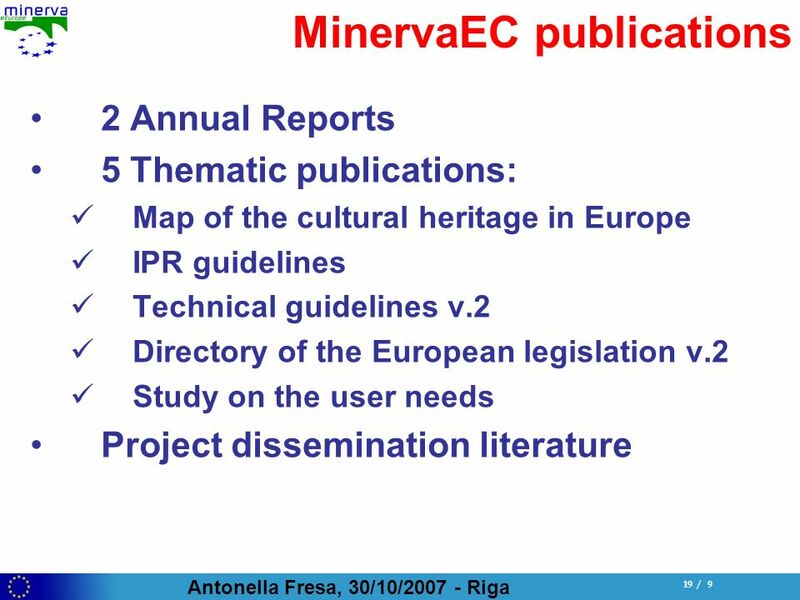 15 Antonella Fresa, 30/10/2007 - Riga 15 / 9 MinervEC objectives To improve accessibility to and visibility of European digital cultural resources; To contribute to increasing interoperability between existing networks of services; To promote the use of digital cultural resources by business and citizens; To facilitate exploitation of cultural digital resources, providing clear rules for their use and re-use, respecting and protecting the creators rights. 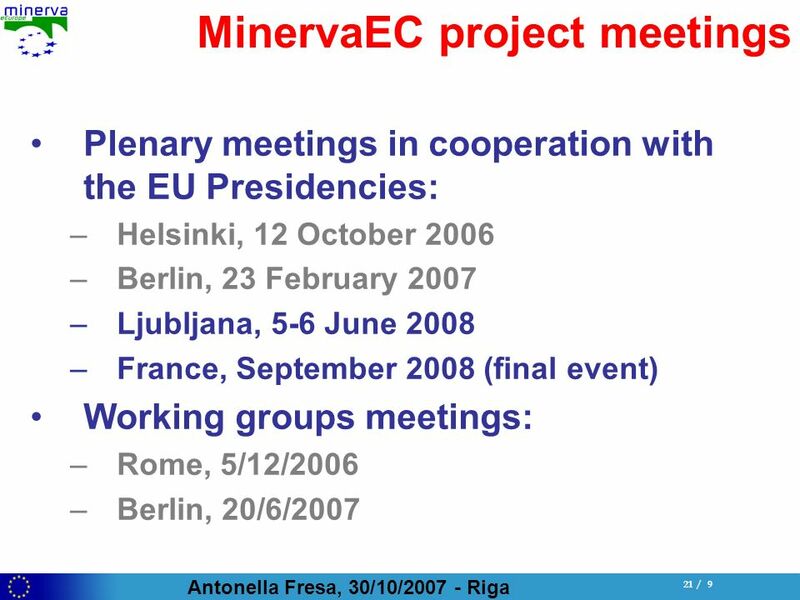 16 Antonella Fresa, 30/10/2007 - Riga 16 / 9 MinervaEC targets Beneficiaries of the actions of the project: public and private organisations and institutions that create, collect or own digital content; private citizens, interested in receiving quality contents, reliable and directly responding to their interests; universities and schools, which wants to use cultural contents for educational purposes in a legal and safe environment; small and large enterprises interested in (re)using digital cultural content. 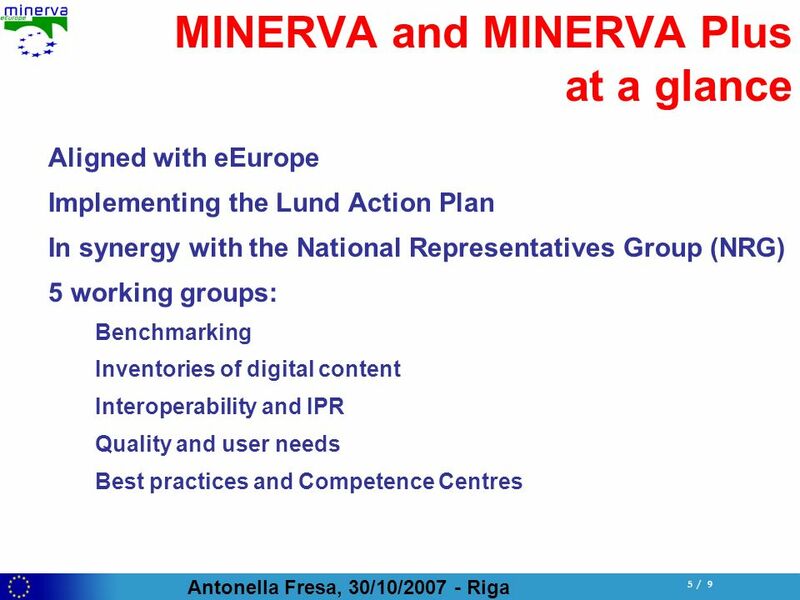 17 Antonella Fresa, 30/10/2007 - Riga 17 / 9 MinervaEC impact 3 main directions: Stimulating decision makers and implementers in carrying out their initiatives of content enrichment, Creating the conditions to improve the quality of cultural content and services, Enhancing accessibility to cultural digital content. 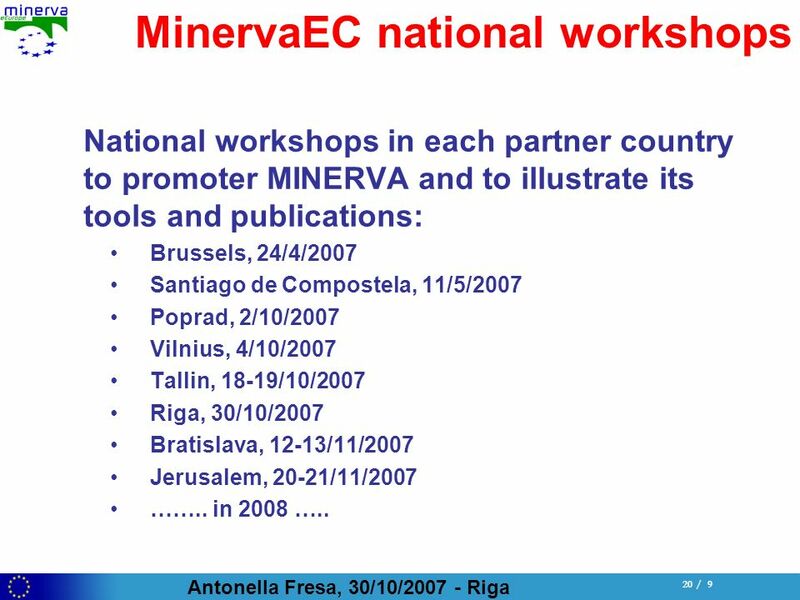 20 Antonella Fresa, 30/10/2007 - Riga 20 / 9 MinervaEC national workshops National workshops in each partner country to promoter MINERVA and to illustrate its tools and publications: Brussels, 24/4/2007 Santiago de Compostela, 11/5/2007 Poprad, 2/10/2007 Vilnius, 4/10/2007 Tallin, 18-19/10/2007 Riga, 30/10/2007 Bratislava, 12-13/11/2007 Jerusalem, 20-21/11/2007 …….. in 2008 …..
Download ppt "Antonella Fresa, 30/10/2007 - Riga 1 / 9 Antonella Fresa Technical Coordinator MinervaEC MInisterial NEtwoRk for Valorising Activities in digitisation,"
1 Department for Research, Innovation and Organization General Directorate for Technological Innovation and Organization Arch. Antonia P. Recchia General. Amman, 13/12/2011 Antonella FRESA DC-NET and INDICATE Technical Coordinator Central Institute Union Catalogue Italian Libraries Towards a Digital Cultural. Athens, 28th June 2005 Antonella Fresa MINERVA and MICHAEL Technical Coordinator Ministerial NEtwoRk for Valorising Activities in digitisation. 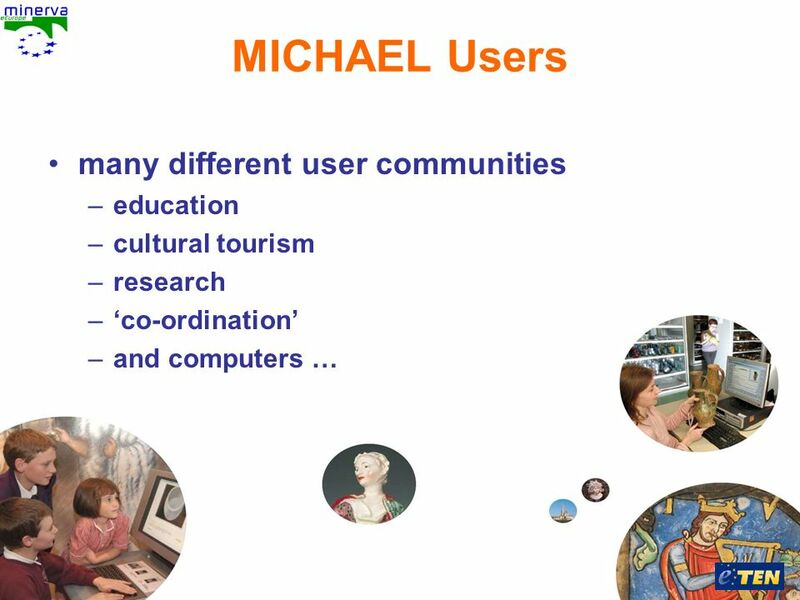 MICHAEL the service for accessing European digital cultural heritage The MICHAEL Project is funded under the European Commission eTEN Programme Antonella. Jerusalem, 21 November 2007 EVA-Jerusalem 2007 Rossella Caffo - MiBAC National and international initiatives of the Italian Ministry of Culture for the. Page 1III SEEDI International ConferenceCetinje, 13th September 2007 MICHAEL: a network of portals promoting online access to digital culture Giuliana. 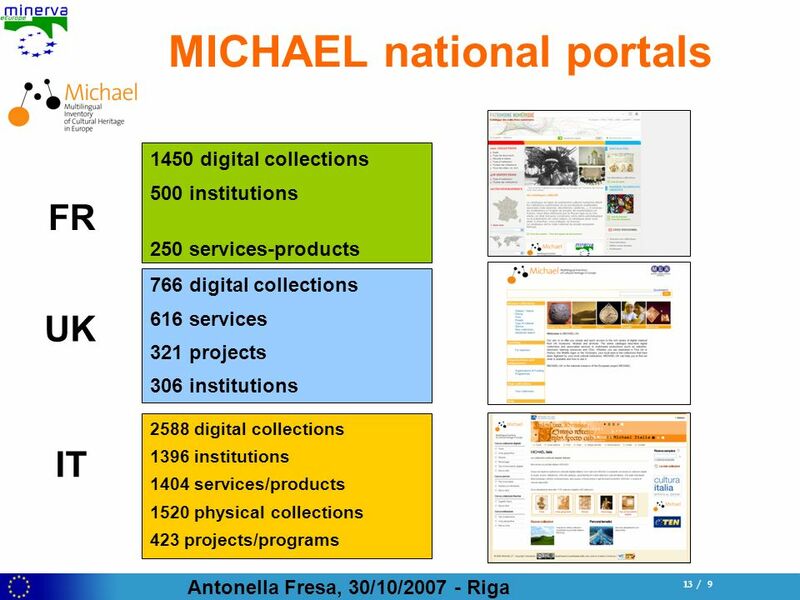 Antonella Fresa, 24/4/ / 9 Antonella Fresa Technical Coordinator MinervaEC MInisterial NEtwoRk for Valorising Activities in digitisation, eContent. 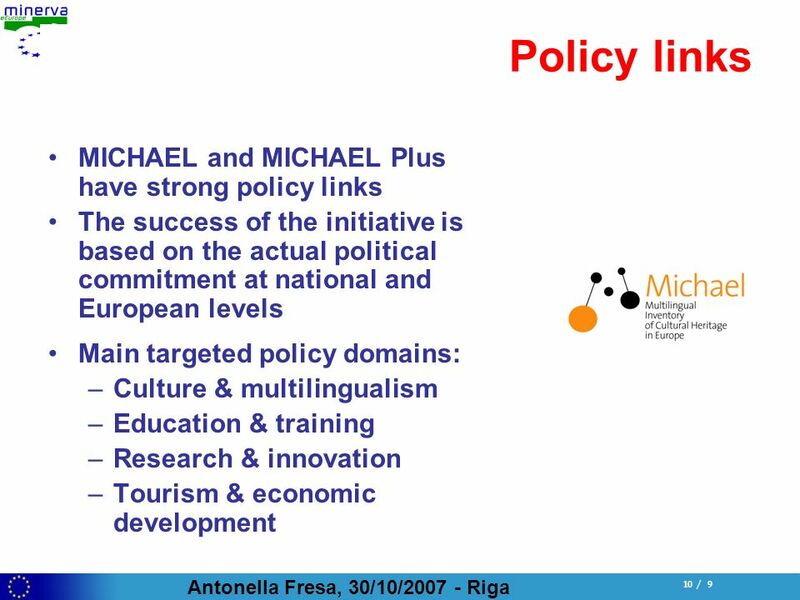 Impact and benefits Rossella Caffo, Project Manager Ministero per i beni e le attività culturali Warsaw, 19 May 2008. 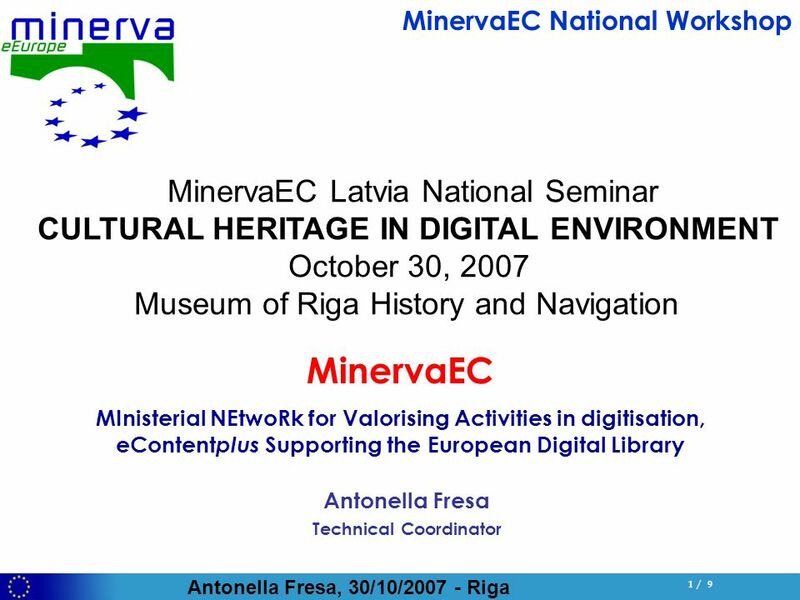 Berlin, 7-8 April 2005Antonella Fresa Ministerial NEtwoRk for Valorising Activities in digitisation Why MINERVA? 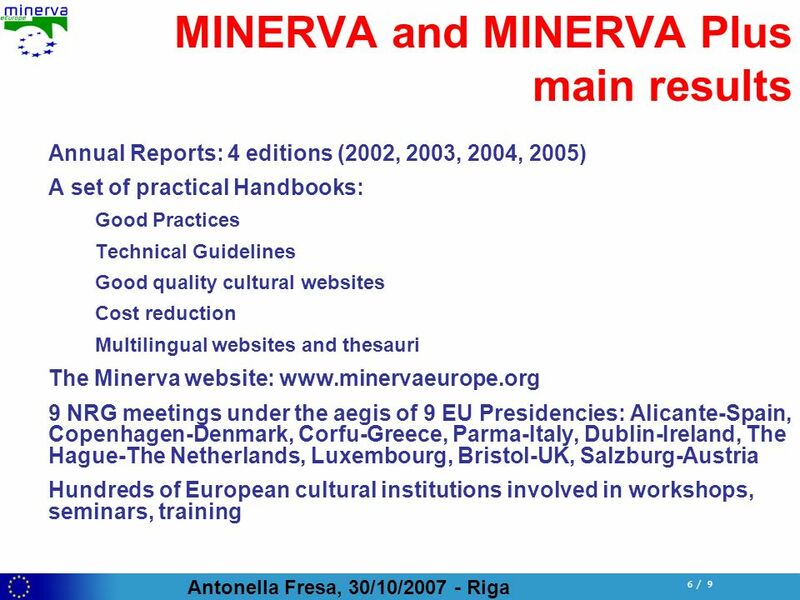 a European network for promoting culture. 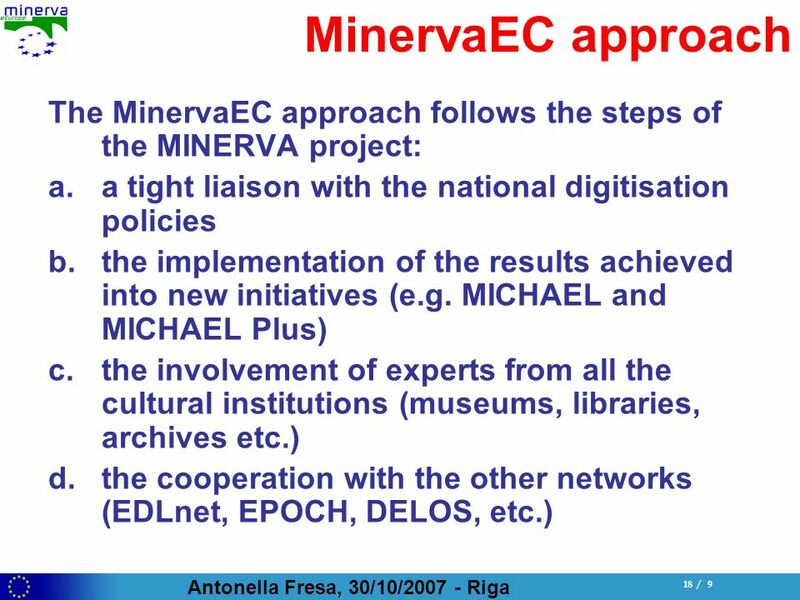 The MINERVA Project Marzia PiccininnoLondon, 25th July 2003 Ministerial NEtwoRk for Valorising Activising in digitisation. 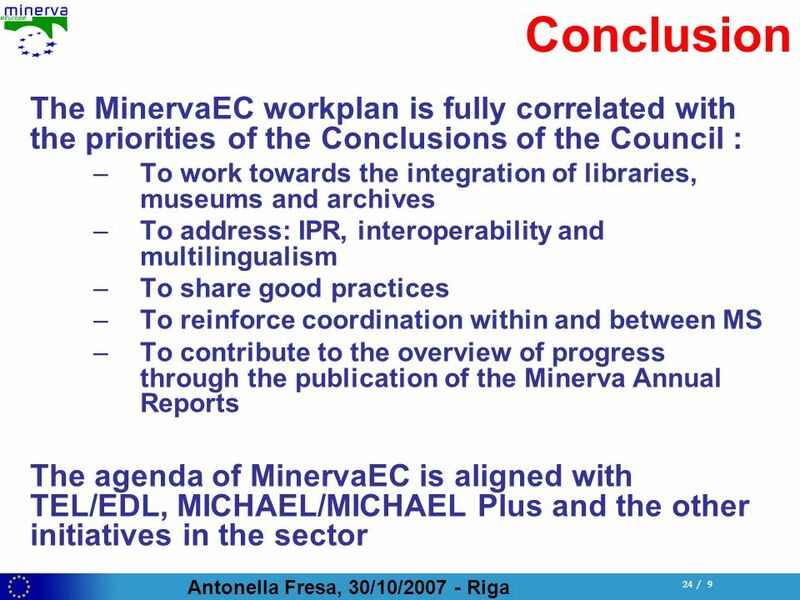 The MINERVA Project Marzia PiccininnoPrato, 13th April 2004 Ministerial NEtwoRk for Valorising Activising in digitisation. 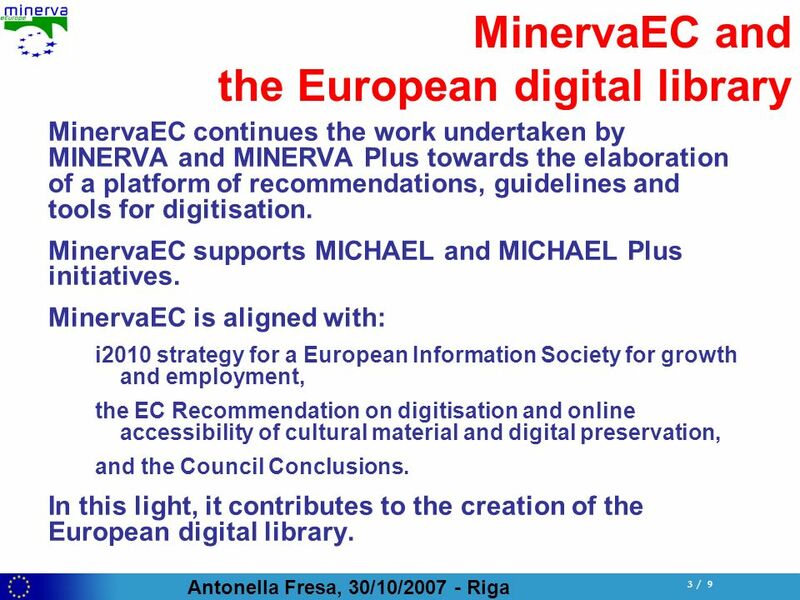 MinervaEC: Standards and Guidelines for Digitisation in a EU Framework Brussels -19 September, 2008 Second national workshop BIBLIOTHÈQUE ROYALE DE Belgique.